Humans are very curious and inquisitive beings. 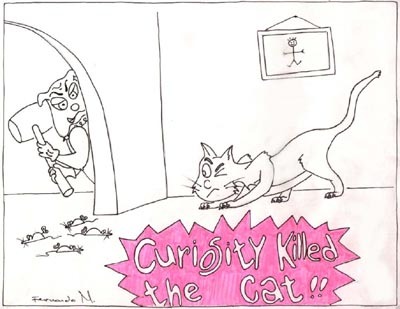 I’m positive that a large majority of us are aware of the common English proverb-idiom-phrase “curiosity killed the cat,” which essentially means that you could be entangling yourself in problems if you’re trying to find out more about something that you don’t necessarily have to or should know. But being curious about anything is necessary for the development and improvement of our species. Being curious is not and will never be a negative thing. Of course, no one should meddle into other people’s private business excessively or purposely, but they should remain curious about all other things. It will lead to new ideas, and you may end up seeing something in a different light. Or, you may even change the world. Had Isaac Newton never questioned why the apple fell on his head or Bill Gates never pondered on technology, gravity could have remained a mystery and Microsoft wouldn’t have affected the lives of millions. But the cat has never had to explain gravity or come up with ingenious software to affect someone or something. You won’t have to either, but you can leave your own mark on this planet – even if it’s tiny – if you want to. Just be curious. Asking a question about anything. Then, answer your own question. Go on the Internet, talk to people, read, send e-mails, etc etc. If your question calls for action, do it. If you need help, get it. I know you won’t be able to do everything, but you can definitely do anything. So get to it! And remember these two things: (1) always, always, always ask questions, and (2) cats have nine lives. So what are you curious about? This entry was posted in Questions in Life and tagged asking questions, christinepham, curiosity, human nature, humans, innovation. Bookmark the permalink.